Full author list: Nico Tatarowicz, Toby Davies, Kevin Eldon, Ali Crockatt, David Scott, Laurence Rickard, Jeremy Dyson, Simon Judd, Alex Carter and Holly Walsh, Kevin Eldon, Holly Walsh, Ed Easton, Kiri Pritchard-McLean, Tony Way, Toby Davies, Dafydd James, Nico Tatarowicz, Alexander Kirk and Melissa Bubnic. Full narrator list: Jack Dee, Sally Phillips, Rebecca Front, Kevin Eldon, Harry Enfield, Sarah Solemani, Sharon Horgan, Charlie Higson, Richard Hammond and Jessica Hynes, Simon Bird, Tamsin Greig, Morgana Robinson, Greg Davies, Robbie Coltrane, Sarah Millican, Catherine Tate, Richard Ayoade, Paul Whitehouse, Carrie Fisher, Jimmy Carr, Christopher Lloyd. 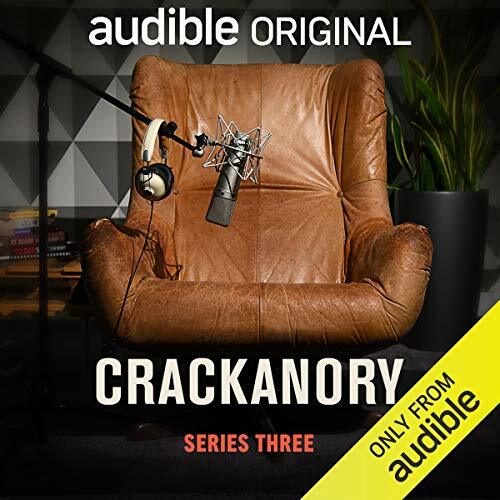 As an Audio Show – free for members – when you add Crackanory (Series 3) to your library, you’ll get all 12 episodes, each with a runtime of about 15 minutes.